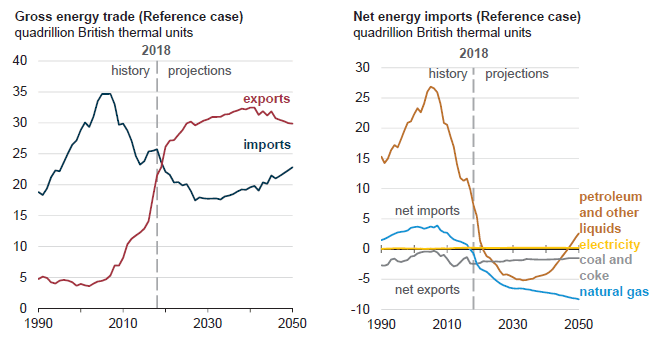 U.S. energy exports in 2020 are projected to surpass imports for the first time since 1953, thanks to the continued growth in petroleum and natural gas exports, according to the U.S. Energy Information Agency’s Annual Energy Outlook released on Jan. 24. The trend is expected continue for the next three decades driven by large increases in the production of crude oil, natural gas, and natural gas plant liquids, amid a slow growth in domestic energy consumption. The U.S. became a net natural gas exporter in 2017 after almost 60 years due to increases in liquefied natural gas export capacity and expansion of the cross-border pipeline network into Mexico. The power generation mix will continue to see a notable shift as lower natural gas prices and plummeting costs of renewables make these resources increasingly competitive, the agency said. Generation from both coal and nuclear is expected to fall over the projection period through 2050, as less economic plants retire. Natural gas plant liquids are expected to represent almost one-third of cumulative U.S. liquids production from 2019 to 2050, supported by continued development of tight oil and shale gas resources. The agency projects natural gas-fired electricity generation to rise from 34 percent in 2018 to 39 percent in 2050, while renewables will rise even faster reaching 31 percent, up from 18 percent, over the same period. Nuclear generation is forecast to decline from 19 percent to 12 percent, while coal’s downturn is more pronounced dropping from 28 percent to 17 percent. Domestic energy consumption is expected to remain relatively flat owing to growing energy efficiency across end-use sectors, despite a continued expansion in the U.S. economy.